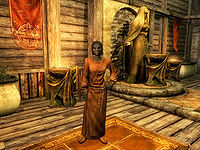 Dinya Balu is a Dunmer priestess of the Temple of Mara in Riften, and the wife of Maramal. She will request that you help some people with their love, and hand out religious missives to the citizens of Riften. She sleeps from 11pm to 5am, then wakes up to clean the temple for two hours. At 7am she has a one-hour breakfast, then attends the temple, praying at the altar, wandering around the place, or conversing with Maramal. At 11am she has a one-hour lunch before heading outside to the Riften market at noon, shopping there for three hours. She returns to the temple at 3pm to eat dinner for one hour. After that, she resumes her duties as a priestess of the temple. An exception to this schedule is during the quest The Book of Love: she will spend the majority of her time worshipping at the temple altar. Dinya wears a set of monk robes along with a pair of boots. She carries a belted tunic and a selection of common items and gold. She also carries a leveled dagger which can be up to elven in quality for protection and can cast the spells Sparks and Lesser Ward. When you are near her, she may tell you, "Visiting Riften? All are welcome at the Temple of Mara." or "Please [sic] to meet you, I'm a priestess at the Temple of Mara." When she is inside the Temple of Mara, she will also greet you, "Lady Mara bids you welcome to Her Benevolence." or ask, "What is it you seek, my child?" She will bid you farewell by saying, "Good journey, my child!" If you have at least started The Book of Love, you can ask her what she can tell you about Mara, she will elaborate, "Mara is the handmaiden of Kyne, the Goddess of the Storm and the Mother of Men. She is the bearer of love and the patron of marriage. If you wish to make a donation to her Benevolence, speak to Maramal and ensure your true love will endure for all eternity." As a priestess of Mara, she will offer food to Riften's beggars, as she will tell Edda, "Oh you poor thing! Come by the temple and my husband and I will keep you fed." and Snilf, "Oh you poor thing, you must be starving. Come to the temple later and let us feed you." Maramal: "They laughed at me again, Dinya. They simply don't understand." Dinya: "I'm so sorry my husband. You must remember, they're at the Bee and Barb to drink, not to listen to a sermon." Maramal: "Yes, yes, I know. I just wish to show them there's more to life than drowning your sorrows in a goblet of mead." Dinya: "You're a good man, Maramal. We're lucky to have you watching over us." Maramal: "It fills me with joy to hear you're with child, Dinya. They said it wouldn't... that it couldn't happen, but Mara has shown them they're [sic] mistake." Dinya: "And to think I was wandering the ash wastes only two years ago. I never knew my path would lead to you." Maramal: "You were guided here; you were always meant to be here. That's the way of things." Dinya: "Then I thank Lady Mara with all my heart; for you, for our child and for our love." Brand-Shei: "Dinya, about that incense you requested? Its [sic] not arriving anytime soon. The Khajiit caravans are having tough times getting through." Dinya: "That's a shame. What's causing them all the trouble?" Brand-Shei: "There's the stories about Helgen, bandits, skirmishes between the Stormcloaks and the Imperials... it almost seems endless." Dinya: "Chin up, Brand-Shei. Lady Mara will provide us strength and guidance through these difficult times." Spread the Love: Distribute religious literature to the citizens of Riften. "To love is to know the true nature of the gods." To start The Book of Love, go to the Temple of Mara and ask Dinya which of the Eight Divines she serves. She will respond, "We are devoted to the Goddess Mara, who gave mortals the gift of love that they might have a hint of eternity. Her blessings are many. To love is to know the true nature of the gods." Asking her if you may receive her blessings will have her reply, "Not all can hear the broad echoes of deepest dawn." and tell you what is required: "To receive the touch of Mara, you must first act as her hands in the world. Explore the facets of the infinite jewel." She will end by asking you, "Are you prepared, then, to help bring the light across this land?" If you decline, saying that you don't think you can help her, she will say, "Do not forsake your heart, child, for it may one day come to surprise you. Mara will always accept into her arms should you seek return to her fold." Even after you've refused, it is still possible to aid the temple. Talk with Dinya again about this and she'll reply, "Always, child. Mara's mercy is ever-flowing." before asking you again if you are prepared. Should you accept the quest, she will continue, "The dawn surely opens upon you, child. You must bear its light that all may see." Seemingly in a reverie, she will tell you, "Mara has reflected an image to me. At the foot of the throat and young woman... almost a girl... her fickle love must resolve itself." and clarify your objectives: "The village of Ivarstead. The woman, Fastred. This is the prayer heard by the goddess and relayed to her servants. Return when she has seen her path. I will entreat Mara on your behalf." Upon ending conversation with her during this quest, she will say either "The dawn surely opens upon you, child. You must bear its light that all may see. ", "May you carry the warmth of Mara to all corners of the frozen wastes." She will also greet you by saying, "Lady Mara's messenger returns. What can I help you with, my child?" After you've helped Fastred with her romantic interest, speak with Dinya about this, and she will be overjoyed: "How wonderful. Like the sea, their love roils and swells, but brings life and nourishment to all." You can ask her if Mara requires more of you, to which she'll remark, "I see you are eager to carry the light." She will continue by telling you, "As you venture, Mara fills my mind ever more with visions of love in peril. Embers lie nestled in stone, needing only fuel to bloom to a flame that will warm all around them." She will again explain what her visions mean: "Go to Markarth. There you'll find Calcelmo, wise, acid, and reclusive. Help him to emerge and state his intentions. This is the prayer heard by the goddess and relayed to her servants." Once you've helped Calcelmo express his love, inform Dinya Balu that you were successful. She will congratulate you, saying, "The goddess smiles at your efforts, child. The dawn shines bright upon you. You have seen the young, fickle love of youth, and helped a more seasoned love find its way." and tell you what to do next: "There is one final aspect we wish for you to explore. For a strong love can withstand storms and even survive death. Take this symbol of Mara. She will guide you to the wandering souls of two whose love was so great that their entwinement binds them to this world." She will give you an amulet of Mara, which you will need to see the long-dead couple. You will be directed to Gjukar's Monument, where a ghost named Ruki searches for her love, Fenrig. Reunite the long-dead lovers and return to Dinya, who will tell you, "Your efforts have helped illuminate the entire province. I trust by now you've achieved a higher comprehension of love. Carry the blessings of Mara with you, so the rest of the province may shine with her glories." She will reward you with the ability Agent of Mara, which reduces damage done by offensive spells. Having completed this quest, you may also start Spread the Love. 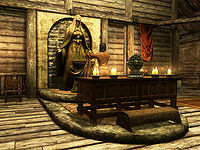 Asking her if the temple needs any additional assistance will have her say, "Riften is drowning in a sea of sin and wickedness and it's my personal mission to let everyone know that the warmth of Mara can see them through. All I need is a messenger to bring Her words to these poor souls by distributing these missives." Tell her that you'll distribute them, and she will be delighted: "Oh my, how wonderful! Lady Mara will be so pleased! Here you are. Now make sure you give out every single one, we can't afford to let even one lost soul stray from Her warmth." She will hand you twenty copies of The Warmth of Mara. During the quest she will tell you, "You represent Mara now. Set an example for all." 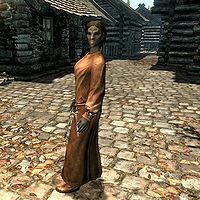 as you end conversation with her, and ask, "Has the Warmth of Mara been given to Riften?" when speaking to her. You may also ask her for any tips on who might accept the missives. She will reply, "Almost anyone in Riften is in dire need of those missives. Speak to them, child. You will know who will listen and who will sin. A word of advice, keep away from the Keep and the city guards. They follow their own path and have already forsaken Her." Once you've given away all of the missives, tell her about this, and she'll be happy: "Oh, splendid! Just splendid! Mara smiles upon us this day. Allow me to give you her gift... a true blessing to aid you in times of need. Despair not, her warmth will protect you always!" She will reward you with a random potion. You can also request more of the missives from her. She will reply, "Certainly! Glad to see you have the task well at hand." and hand you five additional missives.